Organize your Spotify music by any of a wide range of musical attributes including genre, mood, decade of release and more. Select what music you'd like to organize: Your Saved Music; Music you've added to playlists; Music in playlists you follow; or all of it. Login with your Spotify credentials. Organize Your Music will place all of your tracks into a number of bins. There are Genres, Moods, Decades, Popularity and more. Pick one of the bins. You can view all the properties of the tracks in that bin. You can plot the tracks. You can listen to previews of the songs in the bin. Save the staging playlist to Spotify. Don't worry. Organize Your Music will never modify any of the songs in your saved music or playlists. It will only save new playlists for you, and only when you explictly click on the save button. Year - the release year of the recording. Note that due to vagaries of releases, re-releases, re-issues and general madness, sometimes the release years are not what you'd expect. Added - the earliest date you added the track to your collection. Loudness (dB) - The higher the value, the louder the song. Liveness - The higher the value, the more likely the song is a live recording. Acousticness - The higher the value the more acoustic the song is. Speechiness - The higher the value the more spoken word the song contains. Popularity - The higher the value the more popular the song is. Here's a demo of how I use Organize Your Music to make a playlist of my most energtic gothic metal. We are loading up all of your music. This may take a while depending upon how big your music collection is. If you are impatient, you can stop the loading at anytime to work with a subset of your music. Looks like you really enjoy your and . It seems like one of your favorite songs is . Showing the first 400 matching tracks. This is the Staging Playlist . This is where you collect the tracks that you want to save to a particular playlist. There's nothing here yet. To add tracks to this staging playlist head back to The Track List or The Plots and select some tracks. Selected tracks will automatically be added here. 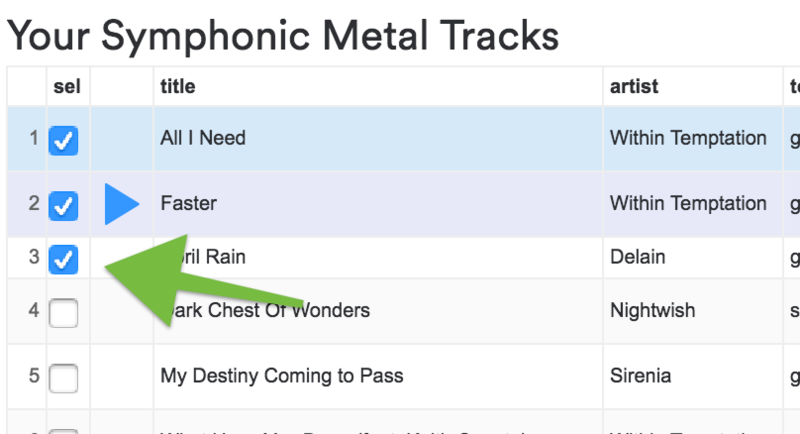 To add tracks from the track list, click on the track list tab to show the track list, and then click on categories of interest in the left sidebar. Tracks in the category will be displayed in the track list. To add tracks of interest to the staging list, click on the sel checkbox for those tracks. To add tracks from the plot list, click on the The Plots tab to show the plots. Add tracks to the plot by clicking on categories of interest in the left sidebar. Tracks in the category will be displayed in the plot. You can then use one of the plot select tools to select particular tracks from the plot to add to the staging list. Powered by Spotify. Created by @plamere at The Science of Music Hackathon in NYC on Aug 6, 2016. Get the source.